I am a teacher. These are my stories. Usually, my classes consist of 12-15 mildly well-behaved children. There are a few exceptions to this (read: all of my fourth grade classes). But the behavior levels in class are directly related to the number of students in the class. Imagine my surprise when I walked into a classroom of not 15 but 30 ten-year olds. Occasionally teachers will get sick and their students get shuffled to another teacher (usually whoever is working the same subject for that grade). I had not prepared for 30 students. I think they could sense it because they were sitting on tables and throwing paper planes and about eight of them were wearing very obvious smirks. I took roll for my half of the class and prayed that nobody from the other half was missing. Sixty eyeballs split into my forehead and I took a deep breath. Then it all unraveled. The game I had planned cannot be played by 30 kids at once. While I can easily yell over 15 little voices, the additional numbers drowned me out like a limbless kitten. Finally, I stood on a chair and bellowed (read: sobbed) loudly, “Please be quiet.” For like two seconds they were angels, but when I had no follow-up instructions past “be quiet” they went back to their shenanigans. The boys were throttling each other, kids were throwing shoes – throwing shoes! – and no one was paying attention to me. After telling two boys I would tell their class teacher that they were being bad, I turned just in time to see a girl give a (probably well-deserved) smack across the face of a boy probably half her size. The sound of palm making contact with face reverberated around the classroom and the boy literally flew off the ground in what seemed like slow motion. Obviously, control was just a fairytale at this point and I shifted my goals to one thing: survival. I have never been so glad to hear a bell ring. People avoid me for language reasons. In order to get cafeteria meals we have to pre-choose food from the machine in the corner of the “canteen” (European term for cafeteria). You have a choice of two meals – my Czech is just good enough that usually I can pick out the main nouns on the menu like chicken steak, potatoes, cabbage, dumplings, fish, and vegetables. My rule is that if I understand two or more words on one of the options, that will be the one I pick. The trick is that you have to order a week in advance or you will automatically be served the first option on the menu. You also have pay for your lunches through an online bank transaction before the start of the month. It occurred to me that I would need a Czech bank account to do this, so I spent several days – with LOTS of help from Jerry and Marilyn – choosing a bank and then going into Prague (a total of three times) to set up and deposit money into my new account. But before I was able to make a transfer, September 30 rolled around and I had not yet paid for my October meals. Between classes, I trooped down to the canteen to find the woman who does the accounting for the canteen. She’s a very pretty blonde who dresses like a high-class woman from the ‘50s. Post-50 years old, super gorgeous, and completely incapable of speaking English, she may be the second most intimidating person in the school for me. I think she may be intimidated by me also because when I wandered into the cafeteria she basically sprinted through the back kitchen door. I had to go up the window and stick my head under the plastic thing to ask one of the cooks if she was available. Hesitantly she same to the window and I explained in my very poor Czech that I hadn’t transferred money yet. No good, she told me. I can’t eat until the transfer had been made. (I could tell she was unhappy to be talking to me without a bi-lingual teacher nearby). And that has to be done by tomorrow? (I’m hoping that’s what I asked). Yes. She was frustrated with me, her lovely green eyes clouded over with discomfort. I’m sorry, one last question. Can I eat today? The cooks in the kitchen audibly laughed from the kitchen and the woman lightened just a little. Yes, you may eat today. It’s good. Good, but not perfect. I forgot to pre-order my meals, so this week I automatically received the first option of everything. Yesterday was boiled hotdogs, pickles and mashed lentils. But I’m hoping the lunch lady won’t run away from me next time I see her. I’m the only American teacher in school and all the kids love practicing their English on me. I can’t walk down a corridor or past the lunch line without a chorus of “Hello Meh-dy!” echoing around the room. I feel like a popstar. Kids let me cut them in line, they’ll double back to walk past me again – they’re like the world’s cutest stalkers. And because I call everyone “Okurky” – cucumbers – they have started to refer to each other as okurky as well. But as great as the kids are, they are just that. Just kids. And nobody wants to actually be friends with the teacher. Not a single student came to my office, choosing instead to turn in projects late or incorrectly assembled. I don’t think even I would have accepted a candy bribe from a teacher in high school (come to think of it, I actually out-right rejected one from my American Gov teacher who was posing as a lobbyist against the bill I was trying to pass in our fake Senate). On Friday, I pulled out that box of chocolates from my desk and ate every last piece. I started teaching afternoon after-school lessons in mid-September and it’s been a real hay ride. Most of my students are from grades I don’t teach in the morning, so except for a few 7th graders I met while helping to chaperone a field trip to the Italian Cultural Center in Prague (they taught me a Czech song about a mosquito that drinks too much wine and gets sick) most of the faces were new ones. In my 4-5 grade conversation class I have a few 3rd grade girls who signed up. They spoke literally no English and just sat on their chairs like deer watching an oncoming semi approach in slow motion as the other nine boys in the class jumped around, screaming in English and in Czech. All three girls dropped my class today but one of them still waves to me in the hallway. We play “finish the story” a lot in my afternoon classes. For the younger kids this means someone says a sentence and then chooses someone to say the follow-up sentence. So far, every story has ended with at least one student getting eaten by a dragon or a school desk or something equally menacing. 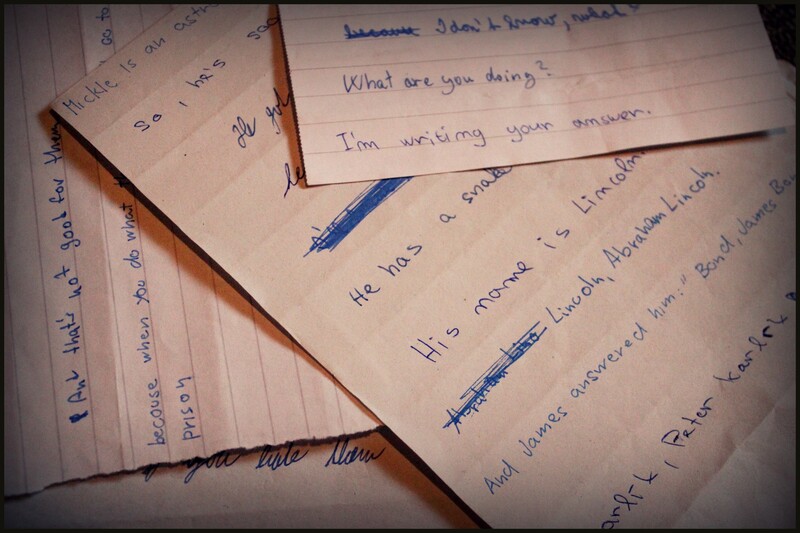 For my older kids, the game includes writing a sentence on a piece of paper, folding it over and passing it to the next person so that each sentence only has one line of context. We got some weird results. (Pictured below). Today I had 30 sixth graders again. But I came prepared. I steeled my stomach as I neared the door. From the hallway I could hear shrill laughter and the dense cloud of misbehavior was practically visible from where I stood just outside the green doorway. I walked in and slammed the door shut behind me. The noise was loud and abrupt enough to get their attention. Seizing the split second of silence, I ordered they divide into three rows. I assigned each child to a team (carrots, eggplants and – of course – cucumbers) and we began a highly competitive relay race that lasted for half an hour. They were focused, they were writing in English, and – with the exception of a few boys who got a hold of some loose chalk and painted their faces like Indians – they were behaved. We spent the last 10 minutes of class learning John-Jacob-Jingleheimer-Schmidt which they took to like champions. My voice was completely gone when the bell rang, but man…it felt good. This entry was tagged Baseball, Education, English language, ESL, Friday, New Teacher, Padres, Prague, Teacher, travel. Bookmark the permalink.